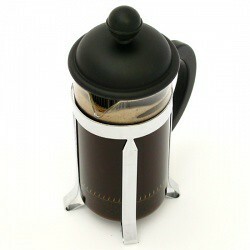 Well last night I pulled out my trusty old French Press and decided to make some press pot coffee. I have been listening to the Coffee Geek podcast for a while and have been contemplating buying a decent espresso machine. They talk about press pot coffee quite a bit and how it is a great way to get into quality coffee as it is a fairly low cost way of getting quality coffee. Here is a quick tutorial on how to make Press Pot coffee with french press. Don’t forget you should use a decent Burr grinder and some quality coffee, I prefer coffee bean’s from Pete’s or Intelligentsia. Disclaimer: None of these companies have paid for this post or given me anything free.